It’s that time of the year. European Summertime. Welcome an influx of travellers posting pics of their summer nights in bikinis in the Greek Islands. If you are off to the Greek Islands this year, here is my hit list so you don’t need to waste time researching and can sunbake* instead. *disclaimer; I don’t promote sun baking and getting burnt. Slip Slop Slap guys. Be sun smart!! Remezzo; Fine Dining right on the water front in the old town. Hippie Fish; Fancy little beach club and restaurant near our hotel in Ornos beach! We had a table booked for sunset and had some lovely house wine and local seafood. The prices weren’t cheap but it is that little step up. Caprice Mykonos sunset bar; We got there at about 7pm which was the perfect time to grab a front row seat to watch the sunset. Once the sun goes down the 80s music cranks and it is a super cute little bar. Beware you don’t want to be too thirsty. The aperols were 15 Euro each! Nice N Easy, Gluten Free Taverna; We only stopped here for a smoothie and coffee but the food looked great from what we could see. They did smoked salmon and other brekky delights all glutenfree. Perfect slice of healthy right on the ocean in Little Venice. Sea Satin; lots of fun and they also break the plates at the end of the night. Elysium; for sunset drinks. Another option if you can’t get a spot at Caprice. KiKi’s Tavern; This place is a MUST! The concept is so gorgeous and Greek. A local beach taverna but without electricity. You have to wait for up to 2 hours and show loyalty to the queue. But it is SO worth the wait. The calamari was insane and the salads are so tasty. Simply and fresh. The owner is awesome. You cannot go to Mykonos and NOT visit this place. About 40min quad ride out of town. Bowl; if you’re looking for a smoothie bowl or some turmeric and kale, visit bowl. 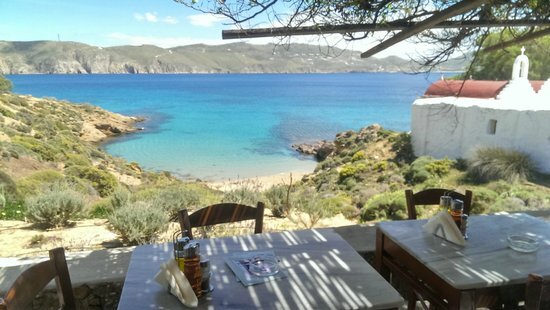 Located near Ornos Beach not far from the main town, this place is healthy foodie heaven. So when the Aperol diet calls for some health, this is your place. Scorpios; fancy beach club worth the trip. Great vibes, maybe some celeb spotting but make sure you call in advance to book because rocking up unexpected won’t get you much unfortunately. Park yourself for the day and party into the night. Saint Anna Beach Club and Spilia Restaurant; a little out of the way but this beach club is less about the partay and more about relaxing under little grass umbrellas. The resturant Spilia is located around the rock wall corner and it great for a long boozy lunch. You can flop straight into the water off the rocks next to your table. If you have a day bed at Saint Anna booked they will save it for you whilst you head to lunch. Day beds are about 50 euro and get cheaper as you make your way to the back row… save some money, take the back row. Ftelia Beach; beautiful beach if you’re in the area. Good to families or people who want to skip the party scene and work on their tans. Hire quad bikes/ATV to get around; not only is it fun but it is a really good way to get around, easy to park, super breezy and you get a little tan as you’re cruising around the island. Being from London and Perth there is something about a quad bike that screams Greek Islands to me. We hired one in every island we went to. Make sure you do your research to get a good deal and travel insurance is always a good thing. To Kyma; Located on the other side of the island. This place was a total GEM! Local, fresh, cheap and cute. You even get a free ice cream when you get the bill. To Mortari; ‘mama’s flavours’ This little restaurant located behind the main town windmill and port. Their zucchini fritters were amaze! So cheap. Glass of house wine for 2.50 euro!! Bepop Cocktail Bar; Park yourself at this little roof top gem for sunset. Perfect spot for a cocktail. Aperol obvs. Mira Taverna; along the water front but one of the better ones for dinner. Great local food. Hire a Quad Bike/ATV. It is a large island and there is lots to see. Go to Punda Beach Club. There is a cheaper one and a fancy one. You’ll know by the state of the bean bags and umbrellas. We chose the cheaper one and it was great. Hire a SUP board here too. Parapho beach; You’ll only pay 9 euro for a set of sun beds here and it’s a super beautiful beach. A lot quieter than the others. Oia Sunset; beware of the other million tourists that will fight you for this view. The best way to see it would be to book a table at one of the high end restaurants in Oia. Just remember to see what time the sunsets because if you book dinner for 7pm you’ll miss it by hours. Otherwise stroll up along Oia at sunset and try find your place to sit. It is a stunner. Imerovigli; this is the town in between Thira (the port) and Oia (the tip). This was where we stayed and it was breath taking. You don’t get the sunset because it is hidden behind a headland but it is postcard perfect. We stayed at Aqua Luxury Suites. This Santorini Winery; spend the afternoon and go for a wine tasting. You can select 6, 12 or 18 wines to taste. Expect to leave tipsy so make sure you designate a quad driver or get a cab. The view from the winery is beautiful. The black beach; Perivolos is the longest of the black sand beaches in Santorini located on the south side of the island. Worth a trip. The red beach; Perissa. The red rock makes the sand red so it is a beautiful thing to see. Unfortunately because the tourists know this it is a bit touristy but if you are looking for a beach it is a good one to see. The cliffs are very impressive. Boat tour to the Volcano and hot springs; Nea Kameni is the name of the port on the island with the volcano. The boat is a day trip and lots of fun. You can hike up the volcano and get some great views. The hike is easy so don’t worry. The hot springs from the volcano left my white bathers a tad brown so if you have dark bathers take those. The little island you stop off at for lunch is really nice. Always chose fresh seafood. Can’t go wrong. Power plugs; Type C. 2 main round pins. Same as the majority of Europe. Money; Greece is part of the EU therefore use Euros as their money currency. There are some ATMs in the main ports of most islands so if you aren’t taking cash you can withdraw. Island hopping; if you are getting from one island to the next yourself make sure you try book the ferry in advance. There are lots of ferries that leave daily between the main islands and Santoini and Mykonos both have airports that fly direct from London. Oh and freddo cappuccino (iced coffee) is a must all morning long. I love Greece so much. The food. The islands. The people. It is a beautiful country and full of so much passion and love. Happy Summer, hope this helps ya.